The Eastern Gate of Jerusalem, The Golden Gate will open some day, when? Gate of Mercy, the Gate of Gold, the Gate of Eternal Life, the Eastern gate are all names for this ancient gate. This is the only one of the eight gates of Jerusalem which is sealed. It is one of the most beautiful and oldest of Jerusalem’s gates. The gate has a special holiness; legend has it that the Shechinah (Divine Presence) used to appear through this gate and will appear again, and that in the meantime it must be left untouched. This gate was blocked and is kept blocked with stone and rubble by superstitious Muslims. As if that would stop the Messiah returning! Biblically speaking, the most exciting history lies ahead. Created after a dream it was in part inspired by a visit to the site, the book ‘Legends of Jerusalem’ and heavily influenced by the mystical paintings of W M J Turner and Chagall. 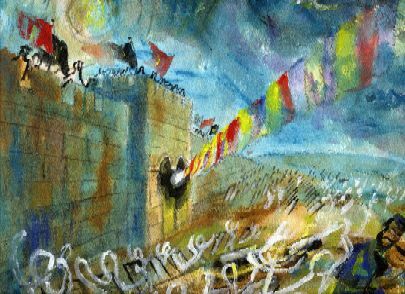 “Coming of the Messiah” includes many elements relating to the legends this beautiful ancient gate has generated, enjoy. This painting more than most has the power to provoke our imaginations and bring us good luck. Size: 230 x 300mm (9″ x 11″), watercolours and acrylics on 250 gsm watercolour paper. Payment can be made securely (by arrangement in easy stages simply contact us to arrange this) bank to bank or using Paypal on this web site ‘payment page’.